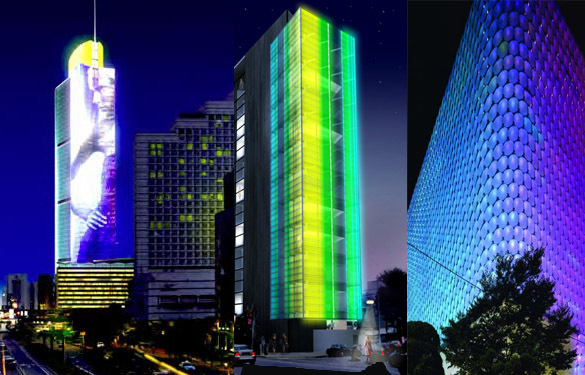 » Digital Building Facades: Does City Council Realize What’s Coming? Digital Building Facades: Does City Council Realize What’s Coming? On this coming Tuesday, the L.A. City Council is likely to take a step that could have far-reaching consequences for the city’s visual landscape, not just for the downtown skyline but for other commercial centers like mid-Wilshire, Century City, Westwood, the Universal City area, and the Ventura Blvd. corridor. And as it did five years ago when it opened the door to digital billboards without a clue to their impact, the City Council appears woefully—and maybe willfully—ignorant of the consequences of approving the first large-scale building in the city with an electronic façade that will display huge, changing, multi-colored images to freeway travelers, pedestrians, and people living in homes and apartments for dozens of blocks around. Councilwoman Jan Perry, who has worked hard as head cheerleader for the billion dollar-plus Wilshire Grand project, believes that a Vegas-style light show playing on all four sides of hotel and office towers—45 and 65 stories, respectively—will add excitement to the area and bring tourists, conventioneers and others eager to lighten their pocketbooks on luxury hotel rooms, restaurants, theaters, and sporting events at Staples Center and the yet-to-be NFL stadium a few blocks down the street. This in turn will bring a flood of jobs—mostly for low-paid workers, but never mind—and tax revenue to help right the badly-listing ship of the city’s treasury. Perry is a true believer when it comes to downtown mega-projects, and seems to regard skeptics as pests and fools, especially if they hail from the city’s hinterlands like the westside or the San Fernando valley. She’s a tireless salesperson for the idea that the source of the city’s greatness is its downtown, an idea far more frequently embraced than examined by some of the more thoughtful city council members one might hope would ask questions, not just pick up pom-poms and jump into Perry’s cheering line. Like council president Eric Garcetti, who got an earful from constituents about digital billboards and signage excesses in Hollywood and finally admitted that he made a mistake in voting for the lawsuit settlement that allowed digital billboards to pop up like fungi and poison people’s homes and apartments with unwanted light. What will he say when a high-rise building with a digital façade becomes a giant, four-sided billboard—yes, a billboard is still a billboard, not matter what others choose to call it–on Sunset or Hollywood Blvd? What about Councilman Paul Koretz, whose westside district is already ground zero for digital billboards? Or Councilman Paul Krekorian, whose district encompasses a large stretch of Ventura Blvd., an area ripe for development with these kinds of buildings? City Planning Commission president Bill Roschen has been a lonely voice in the wilderness of hype, calling for the city to abandon its habit of piecemeal planning and adopt citywide regulations to address issues posed by these “media facades,” or “mediatecture,” as it’s sometimes called. Those issues are easy enough to identify—light pollution, traffic safety, energy use, change in community character—but strangely out of reach for most of the intelligent, educated members of the city council. Do they have a blind love for Perry? Are they afraid of her and the power she has gathered rubbing elbows with the likes of Eli Broad and Tim Lewieke of AEG? Are they getting ready to support her mayoral bid in 2013? What’s certain is that the digital facades of the Wilshire Grand—euphemistically called “integrated digital displays” and “architectural lighting”– are there to broadcast commercial advertising to a very large captive audience. As of now that commercial advertising is forbidden on the towers themselves, but nobody will be shocked if the owners—or some future owner—approach the city to seek entitlement to display ads for Coca-Cola or Bud Light or Toyota, a la the billboards at L.A. Live to the south. In the meantime, that 30,000 sq. ft. of electronic advertising space on the podium will be advertising those products and ringing the property owner’s cash registers in amounts unknown, but almost certainly to be in the millions annually. What makes those digital facades so compelling to building owners and advertisers is the ease with which differing colors and images can be displayed. The timing of image changes can also be varied almost literally with a few strokes at a keyboard. For example, the advertising signage on the Wilshire Grand is now limited to changes no more frequently to every 8 seconds, and the non-advertising images on the towers can change no more frequently than once every hour. However, changing those times, or turning them into full animation would only require some computer programming. Once the City Planning Commission voted and sent the matter on to the Council’s Planning and Land Use Management (PLUM) committee, all semblance of analysis and discourse about the citywide implications of the building’s digital facades disappeared. Chairman Ed Reyes, one of Perry’s reliable allies, and member Krekorian, found everything to like and nothing to dislike about the project. The third committee member, Jose Huizar, was MIA for both committee hearings. Amazingly, neither Reyes nor Krekorian even alluded to the fact that the planning commission had unanimously voted against the electronic signage lighting on the towers. Nor did they mention that the planning department had recommended just over 6,000 sq. ft. of digital signage on the podium, rather than the 30,000 sought by the developer. Not a single question was raised about the quantity of light poured into the atmosphere, even though the results of a scientific study released late last year showed that light pollution in L.A.’s night sky interfered with the breakdown of pollutants overnight, and caused a measurable increase in smog. And taking the developer’s own figures for energy use, the power needed for the signage on the project would create annual CO2 emissions equivalent to almost 1,000 cars.